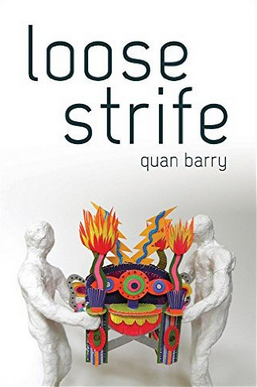 Quan Barry’s fourth book of poetry, Loose Strife (University of Pittsburgh, 2015) focuses on violence, from genocide to domestic abuse. Apparent immediately is Barry’s unusual use of space – a variety of line spacings and dual-justified poems that make for odd spaces between words. Curiously, this explanation is presented as a poem rather than a preface. Another curious feature is that twenty poems are titled “loose strife” which, in the table of contents, are differentiated by including the first words of each poem in parentheses after the words “loose strife.” This repetitive titling reinforces the book’s theme—the ubiquity of violence in human history. The first poem offers a tool: “Draw a map . . . Let it be your way into the poem” (14-15). Maps orient the horror: “Every last map resplendent with death . . . Here is the spot where she found human bones in the well” (31, 36). Most poems are dual-justified poems with groupings of two, three or four lines, some indented, some in columns. The wide spacing of words slows down the reading, rendering the voice more emphatic. The rationale behind the specific forms for individual poems is not always clear. The odd spacing of words and the unusual placement of poems on each page create obstacles for the reader accustomed to more conventionally presented poems but such obstacles are entirely appropriate for the difficult content – lines such as “the man-child hanging by / the shining black noose / of his own hair” (47-49) in “craft (‘The first great poet’).” This is not an easy book. that capacity was the right word. In “loose strife (‘Everywhere in the seven seas’),” Barry describes the demise of sharks as falling “general throughout in a night without end . . . like a rain of lost souls descending” (10, 13) and I am reminded of the end of “The Dead” by James Joyce about snow being “general all over Ireland.” Although the scenes are different, a tone of resignation pervades, a resignation to, or at least an observation of, something natural that seems inevitable. One does not expect any kind of rhyme in this mostly free verse collection but in “The Lord be with you / but not also with you,” the stanzas end with “paradise,” “pair of dice,” “Paired & diced,” “parrot dies,” “Poirot dyes,” and “Per dies” (6, 12,18, 24,36,42). These sonic variations are dissimilar enough that they are not obvious but they serve, almost subliminally, to pull the poem together and give it a light touch. to keep off mice and squirrels. Barry, Quan. Loose Strife. Pittsburgh: University of Pittsburgh Press, 2015.